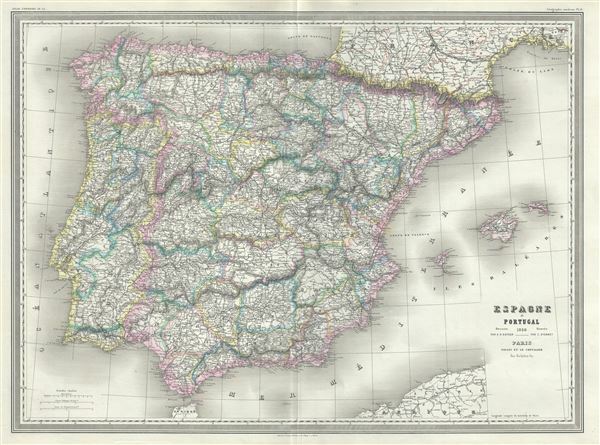 This is a beautiful 1860 elephant folio map of Spain and Portugal by A. H. Dufour. The map covers all of Spain and Portugal from France to the Strait of Gibraltar and includes the Balearic Islands of Ibiza, Majorca, and Minorca. Throughout, the map identifies various cities, towns, rivers and an assortment of additional topographical details. As this map was being drafted, liberal sentiments within Spain were gaining momentum, leading to the Progressive Biennium, in which the Progressive Party tried to replace the conservative liberalism of the Moderate Party and advocated radical liberalism. This map was prepared by Auguste-Henri Dufour and engraved by Charles Dyonette for publication plate no. 25 in Armand Le Chevalier's 1860 edition of Atlas Universel, Physique, Historique et Politique de Geographie Ancienne et Moderne.